Courtesy of RCP Tiburon Mile, San Francisco Bay, California. 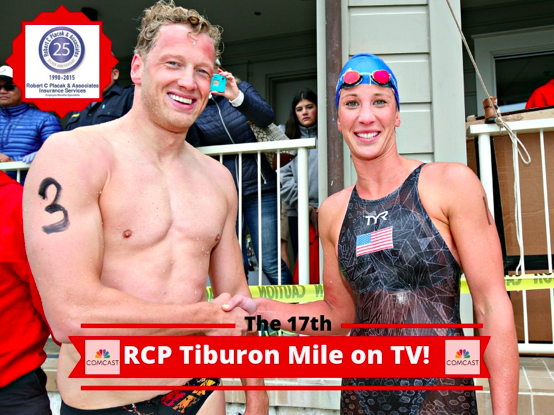 The energy and excitement - the essence of the 17th RCP Tiburon Mile from Angel Island to the shoreline in Tiburon has been captured on film. Race founder Bob Placak says, "This race is available for viewing in the comfort of your own home. Tune in to see the best of pool swimmers and the best of open water swimmers compete in the world's premier international open water swim race where Olympic gold medalist Ferry Weertman sprinted to win and reigning FINA 5 km world champion Ashley Twichell claimed her 4th career RCP Tiburon Mile victory. Interviews with the elite athletes from Mexico, Australia, Italy and the USA are included with some aerial footage and on-the-water views of a race that came down to the very end." "The program did an excellent job showcasing the sport, the competitiveness among the elite athletes, the challenge of swimming in San Francisco Bay, and the exciting down-to-the-wire finish," said Steven Munatones. "It is always great to see the sport of open water swimming on the airways in the United States. It is a very rare occurrence when these opportunities come around - especially when so many great swimmers compete head-to-head and fans can see it up close from the cameras on the official's boat." *Non-Warrior airings apply to people with Xfinity in Sacramento, and will be shown on Channel 36 SD / 720 HD.